Updated Monday October 15, 2018 by Saskatoon Minor Basketball. The 2018 Huskie Brunch has been set for November 4th at 9:30am. We are bringing in Betty Anne Heggie as our guest speaker and are very excited to have her share her wealth of knowledge with all of you. We would love to fill the stands for the Huskie teams on November 2nd and 3rd and to also have a full room at the brunch. For tickets please click the link below to purchase tickets. 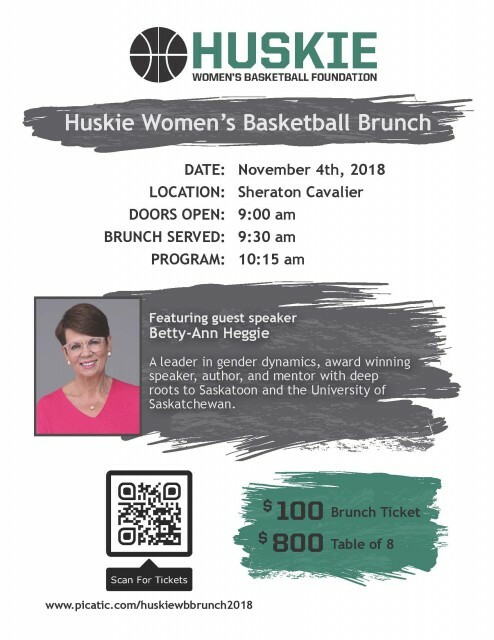 Join us in giving Huskie Women's basketball players the opportunity to play in Saskatoon with a scholarship.